Corinne Manning used to have it all. She lived in a big house, in the “right” ZIP code. She had the wonderful husband and kids. She was a PTA mom and an educator. An addiction to alcohol led to Manning’s spiraled loss of all those things. She hit rock bottom when she became homeless and found herself hiding behind bushes in a neighbor’s yard, using a water hose to bathe. That was in the summer of 2015. Just For Today is a nonprofit residential addiction recovery program based in Taylors. Founded by Cassandra Brayboy, the program is based on the 12 Steps of Recovery. But the solution most women find there is God. “That’s what I preach,” said Brayboy, an electrician whose program has four houses and is currently serving 24 women. Addiction, Brayboy said, is a deadly disease that is mental and physical and it takes. “What this program does is give back. I try to assist them in getting their lives back, being productive members of society again,” she said. As part of the 18-month program, the women get help finding a job. Transportation is provided. Just For Today is sober living in a supportive environment, Brayboy said. Manning has been living in a Just for Today’s 1930s-style mill bungalow, with a homey feel, for a year now. 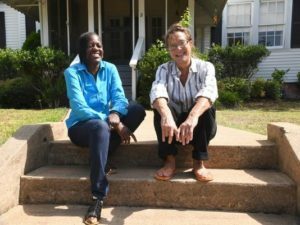 “The laughter on that front porch and the come-to-Jesus talks, that in itself is therapy,” she said. Previously, she’d lived in an affluent Greenville neighborhood. Her ex-husband had been in the investment industry, so “we had money,” Manning said. Manning, who has two “beautiful” daughters, worked in special education. Her job, she said, was high stress. She’d come home wanting a drink and a cigarette. Prior to entering Just For Today, Manning said her family did an intervention. She went to detox and rehabilitation centers. She became homeless after relapsing while in a recovery house that she checked herself into. She visited a friend at a men’s recovery place. They knew Brayboy and gave her a call. Brayboy had a bed available for Manning to move into. Just for Today has led Manning to a year of sobriety and happiness. “It has been the best thing that has ever happened to me and I honestly can say that the hand of God is on this place,” Manning said. Alcohol used to be her “go-to.” It’s not anymore. Brayboy listens and understands because her life’s journey has been like the women she works with. She, too, is a recovering alcoholic, having been sober now for 14 years. Like Manning, Brayboy said she, too, had it all. A native of New York, she had the nice house, the wonderful Christian husband and beautiful two children. Her mother had been an alcoholic and Brayboy said she never told herself she would drink. She was one of the first women to join the union as an electrician in New York. Many of the men she worked with in construction drank. She wanted to fit in, being the only female. “I can honestly say when I took my first drink, I became an alcoholic. Drinking just too off for me,” she said. 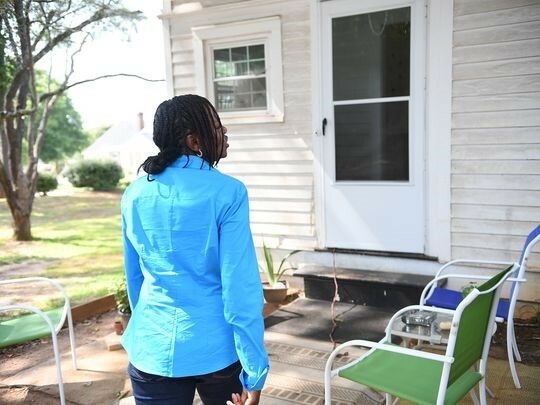 Brayboy’s “jumping off place” was when she found herself in a hotel on Wade Hampton Boulevard in Greenville, wanting to break a mirror to cut her wrists. Brayboy found treatment at a recovery house in Columbia and returned to Greenville. When she discovered how few beds there are here for women recovering from addictions, she decided to provide some herself. She used an inheritance from her father to buy the first house for the program. Money left to her by her mother when she died was used to buy the second house. 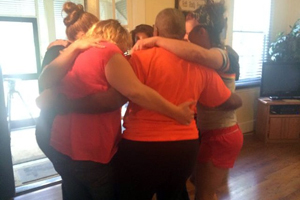 She’s now asking God for transitional homes for the women when they leave her program. Many of the ladies, she said, have criminal records and bad credit reports. And, “if you notice here in Greenville, they’re building a whole bunch of condos and nothing for that lower income people can afford. “Most of the girls here have minimum wage jobs and it’s hard to move out from here into the real world,” she said. Her vision is to build duplexes. “I’m telling God that, so He knows. He’ll give me the desires of my heart,” she said. A message that Manning wants others to know is that addiction doesn’t discriminate. “You can come from Yale or jail,” she said. She appreciates hearing or reading about how bad addiction got for others, because she now can identify with them. Visit http://justfortodayrecovery.org/ for more information. TAYLORS, S.C. —Thirteen years ago, Cassandra Braboy began her recovery. The mother of two is a recovering alcoholic. Just four years into recovery, Braboy started doing just that. In the last nine years, she has helped more than a thousand women begin their path to recovery and it all started with a house. 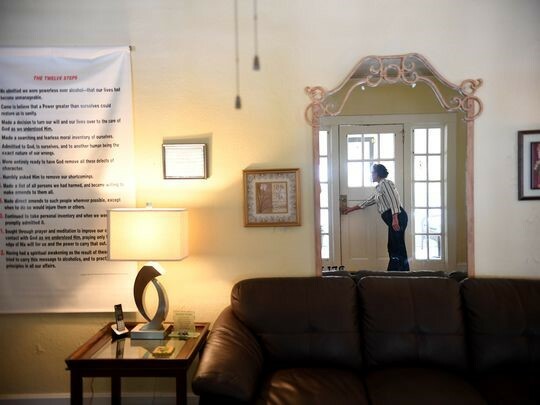 Braboy turned her own house into a recovery center for women. Fast forward to 2015, she now owns two houses and rents another, filled with 18 beds for women who need help. She got her non-profit title in May for ‘Just for Today’ which holds an impressive success rate. Women staying at the original Just for Today home said Braboy’s homes have saved their lives. Nancy Hopper is recovering from crack cocaine. This is her second time staying at a Just for Today house. Hopper said she had been sober for seven years. Corinne Manning said she’s been battling alcoholism for five years. Manning said without Just for Today, she doesn’t know if she’d be alive. “I’m not going to let the rest of my life be drinking and drinking and drinking,” Manning said. Braboy said seeing and helping other women has helped keep her sober. The nonprofit is run on donations and grants. Anyone who’d like to learn more about Just for Today or donate can contact Cassandra at 864-361-8070. Taylors woman achieves non-profit title for ‘Just for Today’ recovery center for addicts. Copyright © 2019 Just for Today Recovery. All Rights Reserved. Customization by Giraffe Web & C3 Creative.